Bobby Kotick says that the closed nature of Xbox Live means that Activision cannot improve the Call of Duty franchise like it wants to. Modern Warfare 2 was the biggest entertainment launch in history, and months after its release it's still being played heavily on Xbox Live. But despite what you might think, that doesn't make Bobby Kotick happy, because it's Microsoft, rather than Activision, that is benefitting from it. 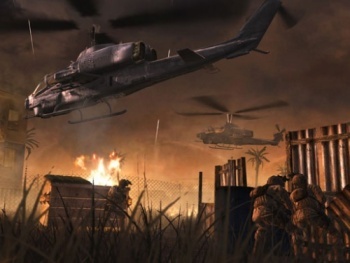 Between November 2009 and April 2010, gamers have logged 1.7 billion hours of online play on Modern Warfare 2, and Kotick believes that the majority of Xbox 360 owners are playing for Gold memberships on Xbox Live because of the Call of Duty series. "We've heard that 60 per cent of [Microsoft's] subscribers are principally on Live because of Call of Duty," said Kotick. "We don't really participate financially in that income stream. We would really like to be able to provide much more value to those millions of players playing on Live, but it's not our network." Kotick has expressed his desire for a Call of Duty subscription service before, and told the Wall Street Journal last month that he believes that such a service would provide a much more "compelling experience" to Call of Duty fans. Getting games with subscriptions on to consoles isn't impossible, Square Enix brought Final Fantasy XI to the PlayStation 2 and Xbox 360, and is bringing Final Fantasy XIV to the PS3, and considering the amount of money Call of Duty must make for the platform holders, it's hard to imagine that Sony and Microsoft wouldn't be interested in some kind of arrangement.